The data visualization community is abuzz with talk about Flourish, a new tool that allows users to easily produce data visualizations online without any need for programming skills. 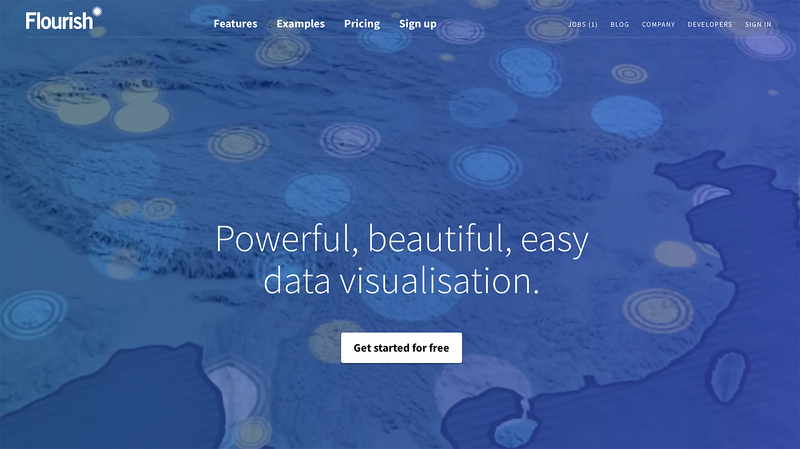 Flourish was created by the founders of the visualization studio Kiln, based in London, with the goal of allowing non-coders to create projects normally out of their reach in terms of technical complexity. Although other tools already exist with that premise (such as the well-established Tableau), Flourish’ ease of use and innovative features make it an immediate contender as one of the best tools out there. It’s entirely web-based (no program to install, you just need a browser) and has a free public version. Flourish workflow starts with pre-created templates showing example visualizations that are used as starting points to upload your data from Excel or other spreadsheets. The template collection will surely grow quickly but you can already see interesting examples like a Sankey diagram, a scatterplot with a time slider, a 3D map with events plotted over time, a fancy 3D globe to use as a flow map, chart grids, etc. It’s great to see that you can create a U.S. county map in the Albers equal-area projection, a much more adequate/accurate projection for U.S. maps (used by the United States Geological Survey, the Census Bureau and good news organizations) than the ubiquitous web mercator projection (this a really weak point of Tableau, for instance). The templates can be customized by developers, which can also create their own. 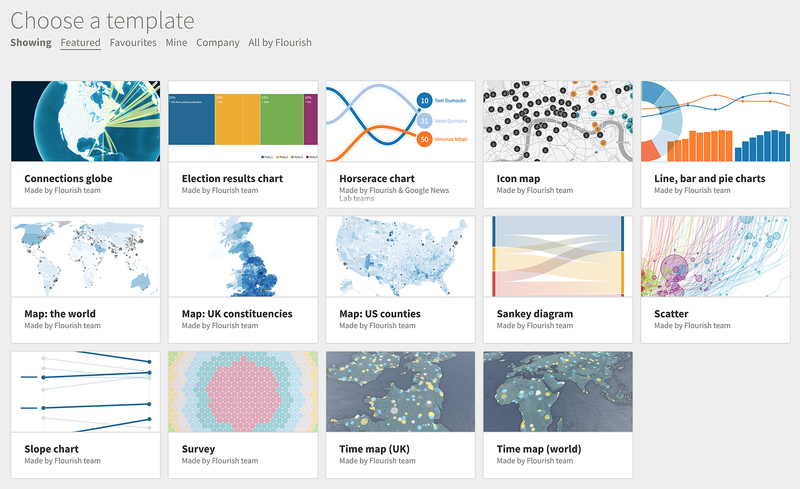 Flourish’ free version allows you to publish and share visualizations, or to embed them in your website. Same as in Tableau, the information will be public and available to anyone once published, which is good for journalists and bloggers, but certainly not for any company dealing with proprietary/internal information. There are paid personal and business versions that will let you to download the HTML code and host it on your own server. Flourish seems an ideal tool for newsrooms since it allows journalists to easily create visualizations but also enables developers to create custom templates and code. In fact, it has partnered with Google News Lab to make it completely free for newsrooms. With any version of Flourish, you can download an .svg file which you can open and edit in Adobe Illustrator. This makes Flourish a powerful tool for print/static infographic as well. 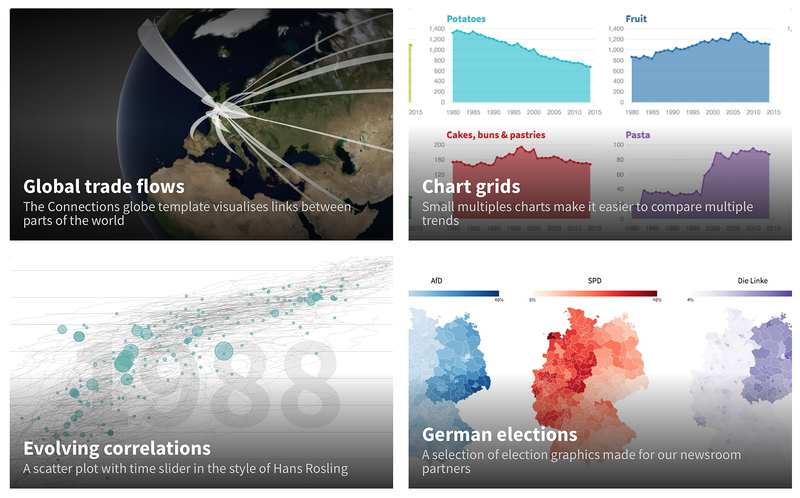 We salute any effort to make data visualization easy for anyone, and we are looking forward to see how Flourish evolves. Its really promising. Give it a try!